This fall, Northwestern students twice received the standard email from administrators following a student’s death, urging them to seek grief counseling at Counseling and Psychological Services if needed. But when Alye Miller did so earlier this quarter after the death of a close friend, she found herself referred to outside treatment within two sessions. Miller, a Communication senior, found herself “out of control” of her own feelings when her friend, incoming Weinberg senior Scott Boorstein, took his own life in September. She reached out to CAPS this fall after already using eight sessions as a freshman, believing that the recent elimination of the center’s 12-session limit would guarantee her the grief counseling she needed. But Miller said she was disappointed to hear that the center was not able to fill her needs due to a scarcity of long-term care resources. 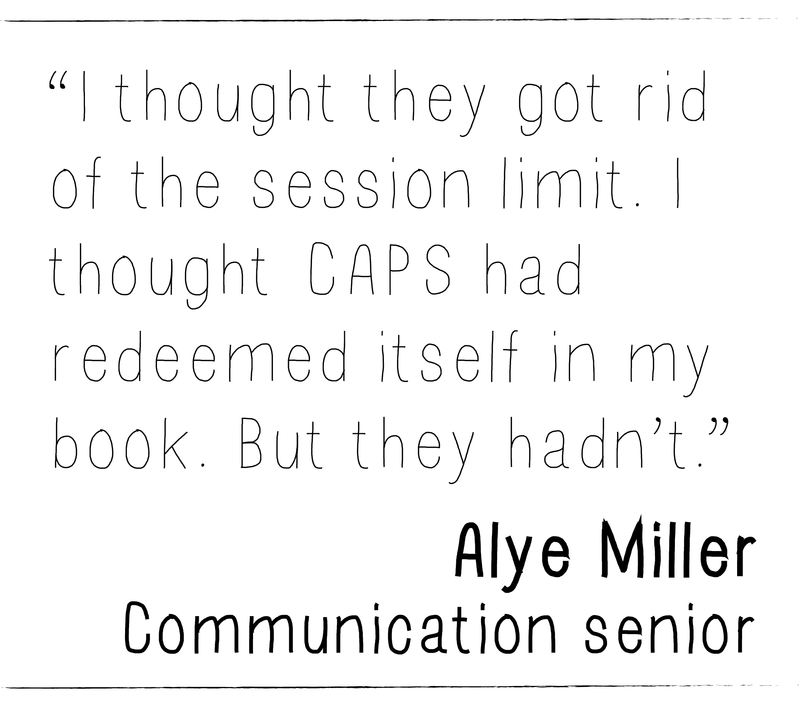 Miller is not the only student who reported being referred out by CAPS earlier than expected. Despite the removal of CAPS’s 12-session limit in April, students said in interviews with The Daily that they felt pushed to find help outside the center. And after the University announced an end to long-term counseling at the Women’s Center, students remain uncertain of what resources are available to them on campus. But CAPS executive director John Dunkle said the lift on the 12-session limit was never meant to turn CAPS into a long-term counseling center. A year and a half ago, CAPS drew criticism after Jason Arkin, a McCormick junior who was on the CAPS waitlist, took his own life in May 2015. Looking back on his son’s history with depression, his father, Steven Arkin, criticized how quickly the center referred Jason out after one phone call. According to CAPS’s 2013-14 annual report, 23.3 percent of undergraduate students who utilized CAPS self-reported that they have seriously considered suicide. This April, vice president for student affairs Patricia Telles-Irvin announced a decision to remove the session limit in an email to students. But in September, some students criticized the University after the Office of the Provost announced to students in an email that the Women’s Center would no longer provide the long-term counseling it had for 30 years. Linzer said the change was meant to consolidate counseling in one place on campus. Staff at the Women’s Center deferred comment to Dunkle and University administrators. Telles-Irvin said she was unavailable for comment before the time of publication. Responding to criticism about the Women’s Center changes, Provost Dan Linzer said in an October interview with The Daily that the change came after a years-long process, including student focus groups that were lightly attended. The Women’s Center reports directly to the Office of the Provost, which he said does not have the proper expertise to oversee health care. Dunkle said there exists some opportunity at CAPS for long-term counseling, but each CAPS counselor can only take up to two long-term cases per year. 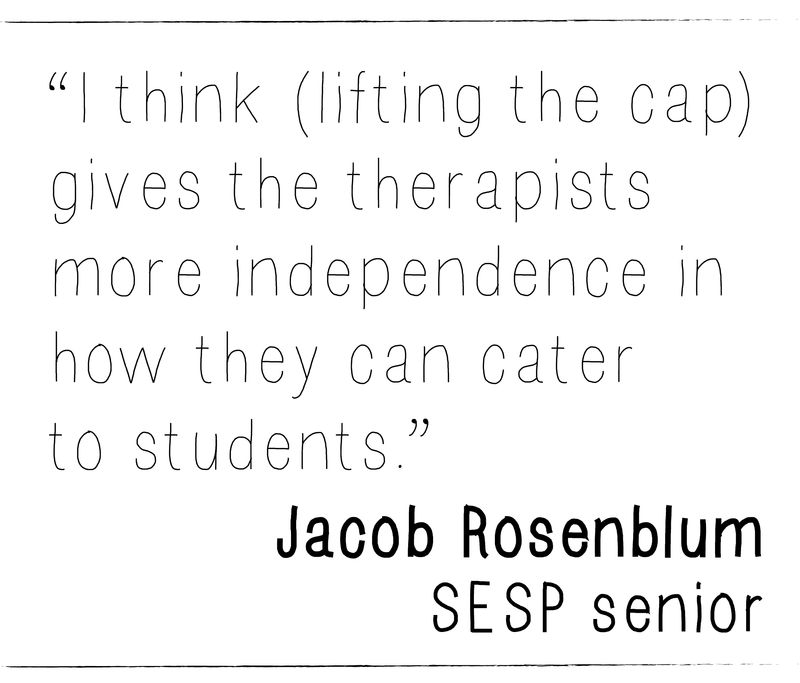 SESP senior Jacob Rosenblum, who has completed seven sessions of counseling so far, had only positive input on his treatment. He said his therapist agreed to continue working with him next quarter. 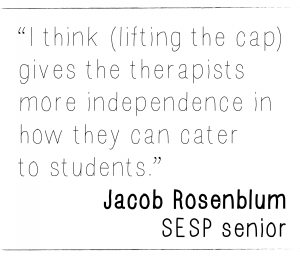 “I think (lifting the cap) gives the therapists more independence in how they can cater to students,” Rosenblum said. But CAPS does not grant everyone a long-term plan, and many students are referred out. After being diagnosed with depression in middle school, Miller said she has gone back and forth between psychological highs and lows ever since. Facing a new set of challenges in college, she began seeking assistance through CAPS. She had her first encounter with CAPS as a freshman in 2014, when she received eight counseling sessions for anxiety. She said the sessions helped, noting that her panic attacks became less frequent. But when Miller reached back out to CAPS sophomore year to finish four more sessions before hitting the limit, she was referred out. She did not call again until her senior year, after Boorstein died. But despite the elimination of the cap, she was referred out again during her second session. McCormick senior Wendy Roldan was Associated Student Government vice president for student life when the session limit was lifted. Roldan participated in the task force that helped research the University’s decision to lift the cap and implement “personalized care plans,” which allow therapists to determine each individual students’ needs upon their first meeting. Roldan said much of the research from the task force — which was led by Telles-Irvin and included administrators, CAPS staff and other students — involved investigating how other schools handle session limits and what would be best for NU’s campus. Dunkle said after reviewing similarly-sized institutions, the task force found that having a session limit did not influence a student’s average number of counseling sessions. Students at these institutions and at NU both average six to seven sessions, he said. Lifting the cap served not to implement long-term counseling, he said, but to remove students’ perceived obstacle of having only 12 sessions. University President Morton Schapiro told The Daily in an October interview that he supported the University lifting the cap, noting that it was something frequently brought up to him when he spoke at dorms and other campus venues. “I was glad to hear they decided to change it,” Schapiro said. 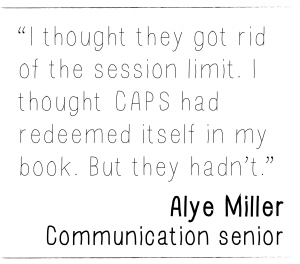 For Medill sophomore Allyna Mota Melville, the CAPS session limit lift was “more of a psychological difference” than a substantive change to how counseling services operated. Mota Melville said she was referred out by CAPS this quarter after seeking counseling services. Mota Melville also serves as the assistant director of logistics for NU Listens, a student-run mental health organization that works with and is funded by CAPS. Having been in conversation with the center’s staff on behalf of her student group, Mota Melville was able to understand the decision to refer her to an outside provider. She said she would prefer to receive free counseling on campus, but came to terms with CAPS’s intention to help her find resources that can last beyond her four years in college. 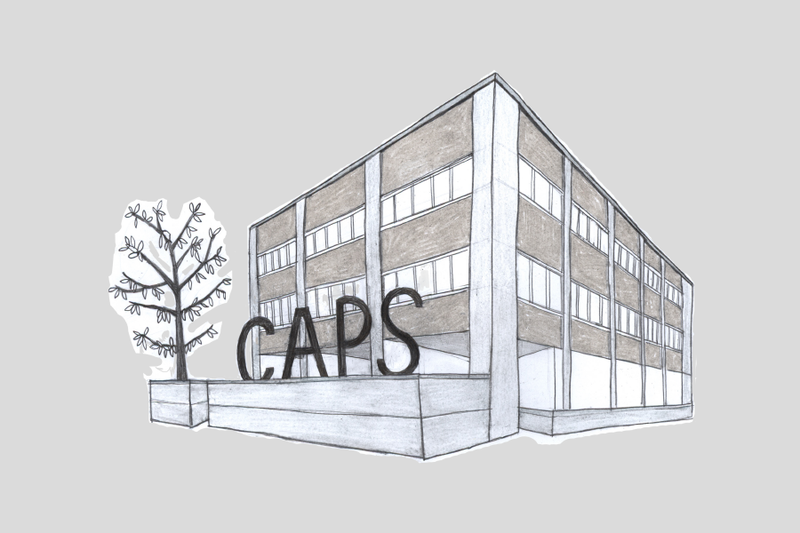 Once students find themselves face-to-face with a CAPS counselor, they report mixed experiences with how the center operates. CAPS’s atmosphere appeared too clinical and impersonal for Medill freshman Will Kang. After filling out his initial intake form and being matched with a therapist, Kang said he felt pushed to seek outside help. “(The therapist’s) demeanor was just really disconnected,” Kang said. Throughout his sessions, Kang said he had the impression that he was simply a “liability.” He said he originally had no choice but to return to CAPS after his initial meeting, as he was told his situation was so severe that University Police would be called if he did not show up to his next session. “It scared the s— out of me,” he said. His following meetings only further encouraged him to seek off-campus help, as his therapist seemed intent on referring him out, he said. After three sessions, he chose to stop attending CAPS. Rosenblum, who believes CAPS saved his life, has a different perspective. He said in an October interview that the therapist he was assigned to felt like a “perfect match” and that he was confident CAPS would support him moving forward. After a total of seven counseling sessions, he later said the center followed through on his expectations of receiving additional therapy during his time as a student. While some, like Rosenblum, continue to report improvements in their mental health, others said they did not find the help they were looking for before ultimately being referred out after a few sessions. Levy first began seeking help on campus when she was struggling with depressive feelings and academic stress, she said. She visited CAPS during Spring Quarter, before the 12-session limit was eliminated this fall. Despite finding her counselor “really kind and calming,” Levy said she felt each session was focused solely on the goal of referring her out. Her counselor encouraged Levy to drop a class amid her academic stress and anxiety, she said. She did end up dropping the class, but her guidance from CAPS ended there. Weinberg sophomore David Jung was referred out after being told CAPS was too full, he said. He followed CAPS’s recommendations to find outside care, which he was told would be affordable. But Jung found the actual cost of one session far exceeded his budget, and ultimately elected not to pursue off-campus treatment. With more and more students seeking services, CAPS is taking steps to increase the resources available on campus, Dunkle said. He said 20 people are currently on the CAPS waitlist. Following Jung’s visit in the spring, CAPS saw about a 20 percent increase in students accessing its services this academic year, Dunkle said. This includes undergraduate and graduate students on both NU campuses. Schapiro said there is no financial limit to CAPS’s funding. “We’ve given CAPS everything they’ve ever asked for and will continue to do (so),” Schapiro said in an October interview with The Daily. After hearing that CAPS has made improvements, Jung said he would consider going back to the center. He said he saw his experience more as a problem with CAPS’s system, rather than its individual staff members. After two new staff hires — one psychologist for specialized outreach to black students and the Black House, and another for peer services such as NU Listens — CAPS now has 20 staffers, Dunkle said. Group therapy — which does not have a session limit — is an effective long-term option for students, said Roldan, the CAPS task force member. She and other members also helped improve the online resources available on the CAPS website and developed the “personalized care plan” approach. For some students, that requires specialized care that CAPS cannot provide, Dunkle said. “If you went to the health service and you had an ACL tear, you wouldn’t expect to get your surgery there, correct?” he said. Miller said she has now found respite from her mental health struggles through a counseling service near her off-campus residence, which she feels satisfied with. But her encounters with CAPS, she said, made her question the true purpose of thecenter. Steven Arkin continues to work in mental health awareness with his wife after their son’s death, and speaks to the public and the medical community about the issue. He said Northwestern has much to catch up on in meeting the reality of mental health issues on its campus.